Fish is by far my favorite food. In fact, I like everything about fish. I like catching fish. I like cooking fish. I especially like eating fish. I even like the way fish smells. If it was up to me, I would eat some sort of fish every day. Unfortunately, Janine does not share my enthusiasm for fish. She likes the way they taste but not how the kitchen smells after I cook them. She would rather order them when we dine out than cook them at home. As a compromise, I promised to respect her olfactory objections providing she sometimes indulges my poisson passions. Now, whenever I break out the frying pan, she breaks out the Febreze. Pan roasting is my favorite way to cook thick fish fillets. Searing the outer surfaces in a hot pan creates a light caramelized crust on the flesh and turns the skin very crispy. Finishing the dish in a hot oven exposes the fish to an even heat source and allows greater control over the fillet’s internal temperature. 2 salmon fillets, cut from the head end, about 2-3” wide. Trim the dark outer leaves off brussel sprouts. Blanche brussel sprouts in boiling water until tender. Remove with slotted spoon and place in a bowl of ice water to stop the cooking. Drain and set aside. Add potatoes to boiling water and cook until tender. Remove from boiling water and place in a bowl of ice water. Drain, wrap in a damp paper towel and set aside. Add shallots and wine to a sauce pan. Simmer until wine has completely evaporated. Add fish stock. Continue simmering until about two tablespoons remain. Add cream. Bring to a boil. Lower heat. Simmer until slightly reduced. Stir in 3 ½ tablespoons of butter. Add lemon juice to taste. Strain sauce through fine mesh strainer. Keep warm. 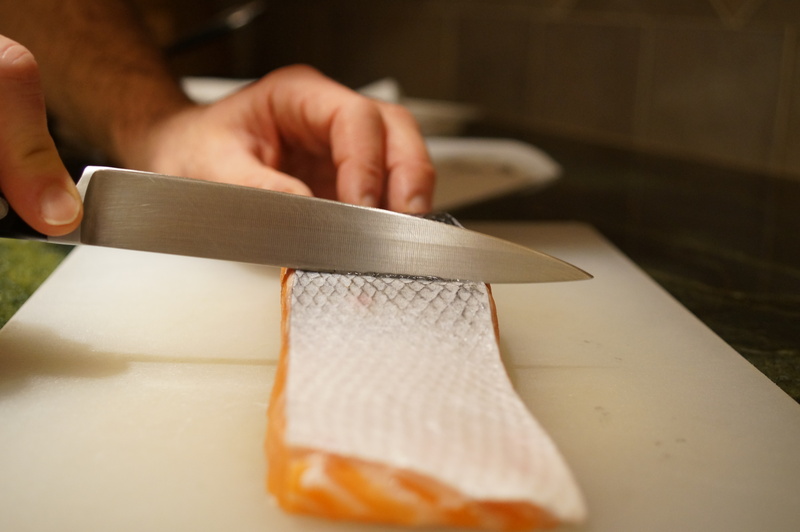 Scrape as much moisture off the skin as possible with the back of a knife. Season fillets on both sides with salt and pepper. Heat oil in frying pan until it begins to smoke. Place salmon skin side down in pan. Sear for a few minutes until becomes the skin brown and crispy. 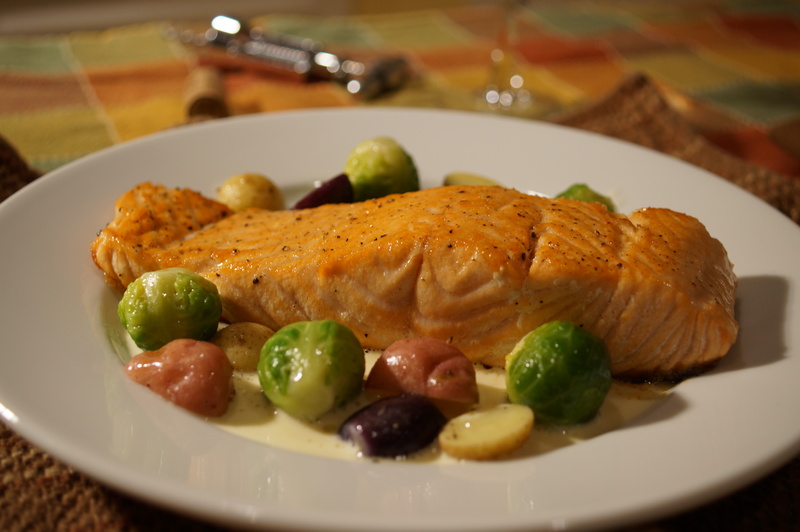 Place pan in the oven and roast for 5 -10 minutes until salmon is almost cooked through. Return pan to the top of the stove. Adjust heat to medium low. Melt 2 1/2 tablespoons of butter in the pan. Spoon melted butter over top of fillets. Continue cooking until the desired temperature has been reached. Melt remaining butter in sauté pan. Add potatoes and brussel sprouts. Gently sauté until vegetables are evenly coated with butter and warmed through. Season the vegetables with salt and pepper. Spoon a few tablespoons of sauce onto plate. Place salmon fillet on top. Arrange vegetables around the fillet. I like to cook the salmon sous vide and then give it a quick sear when its finished in the water bath. Nice recipe, I will be trying it! Thank you for visiting our blog. We really appreciate it.